Working from two modern facilities in Bend, Oregon, BMS Technologies serves clients across the country. 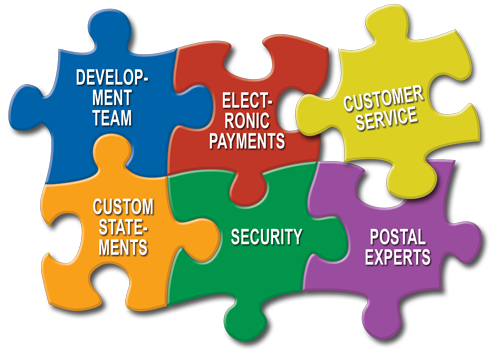 We are a leading provider of invoicing services, online presentment, payment solutions, and traditional mailing services. We offer our clients professional, customized invoicing and statement services. Our simple and easy-to-use system takes the hassle out of billing. We want to make your billing a comfortable experience, allowing you to focus on your core business. We stay current with all USPS Regulations, so you don’t have to worry about an ever changing post office. Let us save you time and money with our state of the art online services, equipment and highly trained personnel that can complete the job in the most accurate and cost-effective manner possible. BMS Technologies takes a streamlined approach to direct mailing. Our services provide an economic and efficient solution while maintaining expedient turnaround times. We have the knowledge and expertise to handle projects of virtually any size or complexity. For us there is no job too large or too small to find a solution that best meets your needs.